Teeth can last a lifetime with proper home care, professional dental cleanings and regular checkups. Consultations can keep you up to date on your options in the fast-changing field of Cosmetic and Restorative dentistry. In addition to a visual examination, Dr. Foutz uses digital x-rays and a periodontal probe to determine if you have any disease present, and if so, to what extent. The periodontal probe is particularly valuable because it can reveal disease long before it’s apparent on x-rays. The probe measures the depth of the sulcus, the separation that exists between the gum and the tooth. A normal sulcus is 2 to 3 millimeters deep. Anything more than that indicates that a pocket has developed – the result of calculus buildup or bone loss due to periodontal disease. The deeper the sulcus, the more advanced the disease. X-rays will reveal the extent of any bone loss, and will also expose any decay that may not have been discovered during the visual exam. 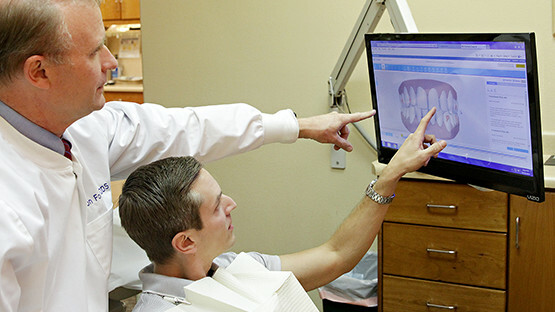 At Dr. Barton H. Foutz, DDS, we use the DenOptix digital X-ray protocol, so the radiation exposure is very small. X-ray exposure does not leave any residual radiation in the body, and has no cumulative effect with x-rays made on any other part of the body. How often should I get a dental examination? You should schedule a dental exam at least every six months. That way your oral health can be properly monitored and problems can be addressed before becoming uncomfortable or requiring more comprehensive or expensive treatment. However, if you do need cosmetic or restorative dental care, Dr. Foutz will gladly answer your questions about the newest procedures that can help give you the dazzling smile you’ve always wanted.